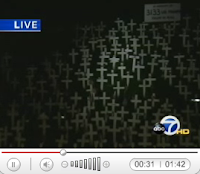 3,170 crosses now stand at the Lafayette Hillside Memorial, one for every soldier who has died in Iraq. While the number of crosses will continue to meet the ever increasing number of war dead the site will now shift from a community art project in production to a space for gatherings and reflection. ABC Channel 7 News covered the event on Sunday. Link to Video. SF Gate also published a better video with voice overs of activist interviews. Link to SF Gate Video. An article in the SF Chronicle followed on Monday. The blog eschew obfuscation has also posted about it.